So I'm watching the new episode of Supernatural. It's not a spectacular show but its entertaining enough and it hooked me when it had an episode with the title 'Criss Angel is a douche-bag'. That's a great title, man. Tonight's episode (I believe the children are the future - another great title. ), spoilers of course, is about a little boy named Jesse who is extremely powerful without knowing it. Anything he believes comes true in a radius of several miles around him. So if he believes joy-buzzers really do electrocute you they do, if he believes the tooth fairy is a leering biker in a Tutu that's who will show up and yank out all your teeth. Turns out he's the Antichrist, but is actually a really nice kid with no desire to destroy the world. 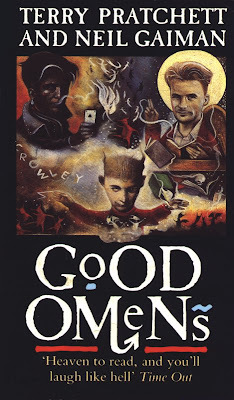 This is, of course also the plot of the novel Good Omens by Terry Pratchett and Neil Gaiman. Let's be charitable and call it a tribute.